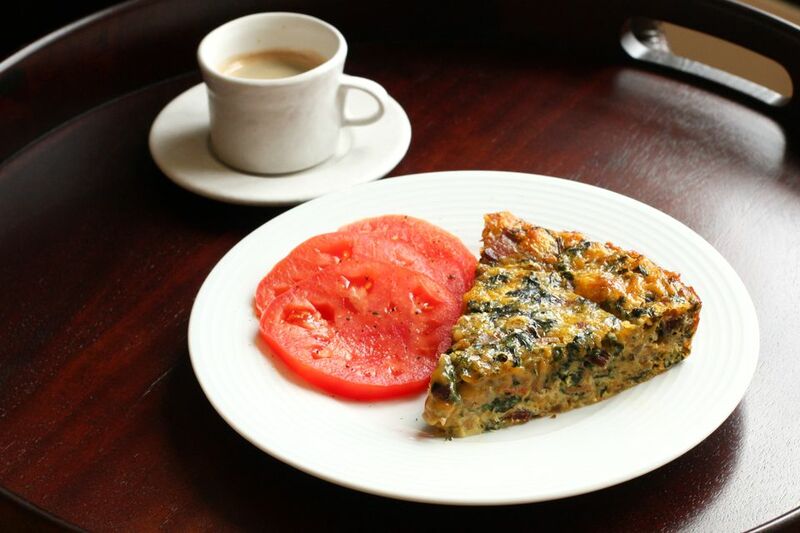 Serve this crustless quiche for brunch or breakfast, or with a cup of soup or a salad for an extra-special lunch. Without a heavy pastry crust, this version is lighter than the standard quiche, plus it's an excellent option if you're following a low carb diet. It's gluten-free, too! If you'd like some extra color and texture, add some chopped red bell pepper or pimiento ​the egg mixture. The recipe calls for cheddar cheese, but Monterey Jack, havarti, Swiss, or Muenster cheese are good alternatives if that's what you have on hand. Feel free to replace the bacon with about 1/2 cup of diced ham or sliced mushrooms briefly sauteed in 1 tablespoon of vegetable oil. Grease a 9-inch pie plate or spray it with nonstick cooking spray. Arrange the bacon in a large skillet and place the skillet over medium-low heat. Cook the bacon, turning the strips frequently. When the bacon is browned and crisp, remove it to paper towels to drain. Meanwhile, peel the onion and chop it finely. Rinse the Swiss chard thoroughly with cold water. Remove the stems; chop them and set aside. Chop the chard leaves and set aside. Discard all but about 1 tablespoon of the bacon drippings in the skillet. Add the onion and chard stems to the skillet and cook for about 3 to 4 minutes, or until tender. Add the chopped chard leaves to the skillet and continue to cook until they have wilted. Add the salt and pepper and stir to blend. Taste and adjust the seasonings, as needed. In a mixing bowl, whisk the eggs. Add the cheddar cheese to the eggs along with the chard mixture from the skillet. Crumble the bacon and add it to the egg filling mixture. Stir to blend. Pour the filling mixture into the prepared pie plate. Bake in the preheated oven for about 30 to 40 minutes, or until the quiche is set—but still has a slight jiggle—and lightly browned around the edges. If you regularly buy packages of pre-shredded cheese, try shredding it yourself. Freshly shredded cheese tastes better and saves money, and it takes just a few minutes to shred with a food processor. Plus, cheese freezes beautifully. Shred a large amount of cheese and freeze it in zip-close bags in 1-cup or 2-cup portions. Label the bags and store them in the freezer for up to 6 months. Because oven temperatures can vary, check the quiche before the designated time.